All of us want to be more productive. All of us want to get more things accomplished. And all of us face the same basic set of obstacles—with email being foremost among them. Be honest: How much time do you lose to email each day? Think about the time it takes you to answer emails; to sift through your inbox to find the messages you need; to respond to all the alerts going off on your desktop or your phone. It’s unreasonable to think you could do away with email, but there are some ways to better control your email habits. Let me offer some suggestions. This step is probably the hardest, which is why we’re getting it out of the way first! Basically, what I recommend is blocking off some time each day to turn off your phone and to mute all your desktop alerts—allowing you to get some work done without even thinking about your email inbox. I recommend at least two hours of email-free time when you first start your workday—but you can adjust that depending on when you’re at your most creative. Take some time to purge. Here’s another suggestion. Do you have old emails that you never acted on, or perhaps never even read? Most of us do. My suggestion: Just purge all those emails, particularly the ones that are more than a year old. Take some time to cleanse your inbox of all that clutter, and I can almost guarantee you’ll survive without any major issues or hiccups. If you haven’t needed it yet, you’re not suddenly going to need it tomorrow. One more piece of advice: Set up some algorithmic filters to sort out your incoming email. For example, set up your inbox to bring messages from important work contacts directly to your attention, but to place newsletters and other automated updates in a separate folder. Most email programs, including Gmail, have some good filtering options that can help your inbox to feel much better organized. 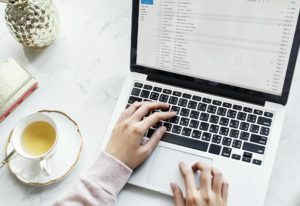 And that’s that—some simple but hopefully substantive tips to exert mastery over your email habits. To talk with me some more about being productive in the workplace, reach out today! Connect with Dr. Rick at www.rickgoodman.com or call 888-267-6098.